Atal New India Challenge is an initiative by Atal Innovation Mission aimed at supporting innovators creating products based on advanced technologies in areas of national importance and social relevance through a grant based mechanism. The vision of the Atal New India Challenge is two-fold: (a) help create products from existing technologies relevant for national and social causes (productization); (b) help new deep-tech products find markets and early customers (commercialization) in the context of India. The scope of the program extends to developing an institutional mechanism and structure to channel potential innovative ideas for products and technologies from Startups and MSMEs on their own or along with organizations, academic institutions and even individual innovators. Atal Innovation Mission (AIM) is Government of India’s flagship initiative to promote a culture of innovation and entrepreneurship in the country. AIM’s objective is to develop new programmes and policies for fostering innovation in different sectors of the economy, provide platform and collaboration opportunities for different stakeholders, create awareness and create an umbrella structure to oversee innovation ecosystem of the country. AIM’s flagship schemes include establishing Atal Tinkering Labs and Atal Incubation Centers, providing scaling up support to Established Incubation Centers, and finding ultra-low cost solution to India’s most intractable problems through Atal New India Challenges and Atal Grand Challenges. NITI Aayog’s Expert Committee on Innovation and Entrepreneurship (“Expert Committee”), chaired by Professor Tarun Khanna, had identified in its report the need to incentivize innovation in areas critical to India’s growth and development, such as health, housing, hygiene, energy and water. 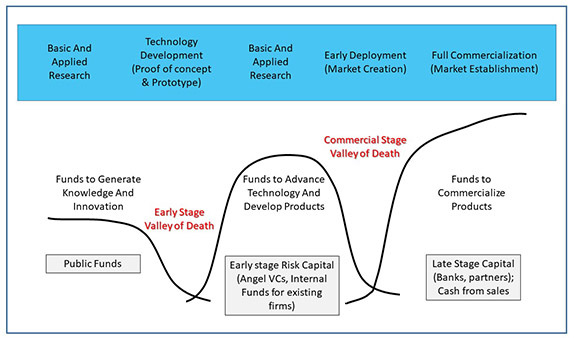 Researchers have long talked of the ‘Valleys of Death’ at the early stage and commercialization stage in taking innovations to market. The Atal New India Challenge aims to address the second Commercialization Valley of Death, in which innovators are unable to access resources for piloting, testing, and market creation. Bringing more innovations in the service of Indian citizens will require more individuals and entities to innovate for Indian needs, and take innovative products to market through startups, government schemes, or other deployment mechanisms. India’s science and technology ecosystem is robust and effective; however, a concern has been raised, including in the Expert Committee, about the ecosystem’s relatively lower ability to create products out of advanced research, and deploy them in the market. This program attempts to fill this gap in the ecosystem by providing grants oriented towards creating commercializable products from existing technologies, to fill needs across various economic and social sectors. The Atal New India Challenge is an open call to design and demonstrate market-ready products based on cutting edge technologies in identified focus areas. Applicants showing capability, intent, and promise to be able to productize technologies will be awarded grants of upto `1 crore, strictly on a milestone basis. The exact amount of the grant shall be decided by AIM and ANIC committees based on the application and business plan, as per the prevailing scheme. AIM reserves the right to modify the scheme as and when required, without prior notification. i. The innovator is productizing/commercializing an existing patent (or published research paper) or product or technology. b) Description, name and number of the patent. If the innovator/researcher is not the holder of the patent, the application should include information on the nature of relationship with the patent holder, such as through licensing fee or profit/revenue share in the business plan, etc. c) Video describing and showing a prototype. ii.The innovator has identified or established partnership(s) with relevant partners for manufacturing, market deployment or early-stage pilots. As the focus of this challenge is to rapidly commercialize technologies/patents into products, it is important that innovator has either identified partners for manufacturing (which could be a MSME, or contract manufacturer, or laboratory) and early- stage pilots or established partnerships with these stakeholders. The applicant will have to provide name and other details of the manufacturer and other potential. Who can apply for Atal New India Challenge? i.Any Indian company incorporated under the Companies Act 1956/2013, primarily a Micro, Small and Medium Enterprises (MSME) as defined in the MSME Act, 2006.
ii. Startups, as defined and recognized by Department of Industrial Policy Promotion (DIPP),Ministry of Commerce and Industry, Government of India. iii. Government or private organizations (other than a Railway organization), academic institutions, academicians, or even individual innovators are encouraged to apply, provided they partner with entities with appropriate manufacturing capabilities. In the current round of Atal New India Challenge, applicants seeking commercialization of products and technologies in the following focus areas are invited to submit their proposal. Climate-smart agriculture Deploy products, technologies, and processes (supply chains) to promote and commercialize climate-resilient agricultural practices, species, and processes. Fog vision system for road and rail Increase deployment of technologies to reduce accidents in low visibility conditions - vehicle-attached, or improvements in street lighting infrastructure, or improved reflectors for higher pedestrian visibility, etc. Systems to predict identify and recognize rail failure using technologies Advanced technology solutions to predict and prevent rail failures viz. automated track monitoring systems, rail track health, signaling and switching technologies etc. Predictive Maintenance of Rolling Stock Solutions to monitor the health and safety of key components of the coaches, freight cars, locomotives which includes bearing and wheels to reduce catastrophic failures leading to improved safety and operating cost. Alternate fuel based transportation Deployment of technologies/products in transportation, using an alternate source of power to reduce carbon emissions - including systems to integrate with existing transportation infrastructure. Smart Mobility Use of alternate transportation mechanisms for newly urbanizing regions / smart cities. Electric Mobility Technologies / innovations to increase the share of electric vehicles in all modes of transportation. Safe transport Technologies / innovations to reduce accidents and fatalities, with a special focus on two-wheelers / pedestrians. Instant Portable Water Quality Testing Develop systems, products, technologies, or protocols to identify nature and/or concentration of biological/chemical contaminants in any given water sample. (i) Achieve source strengthening through innovative, measures and/or traditional water harvesting wisdom. (iii) Replace/repair the aging infrastructure through unique, cost effective, new/innovative technologies/methods. Digital Water Management IT and Mobile phones have enabled easier access to various services. How to use these technologies to solve day-to-day managerial issues to (i) assist to make district water budgets and District/Block level water managers to know on day-to-day basis, the habitation-wise quantity and quality water supplied and (ii) make every household a water smart household by informing them about the quantity and quality of water available from their nearest source to plan their daily family water budget. Ideas can be mix of technologies, management solutions, awareness games etc. "Using big data analytics techniques, how to generate quality information at District/State levels, using above databases, that would aid in policy formulation for effective water education & governance and management?" Mini Desalination plants in coastal areas Low cost, environmental friendly, low power technologies available for setting up and operating mini desalination plants for coastal habitations. Grey water management Many States are providing higher per-capita water supply service levels in rural areas. This is leading to generation of significant grey water in rural areas and needs to be managed usefully. Suggestions are invited for innovative, low cost and simple technologies to manage the grey water in rural areas. Affordable Desalination/Recycling Technology Affordable Recycling technology - Deploy technologies or products to recycle water at household and community levels. Waste management recycling and reuse Deployment of technologies for waste management, e.g. solid, e-waste etc. Garbage composition devices Portable/handheld scanner/device that can distinguish the composition of garbage collected from households as wet or dry. Quality of compost Portable/handheld device that can quickly determine the quality of compost (also whether the compost heap meets FCO standards). Decentralized composting Economical, efficient, modular, aesthetic, environment-friendly and occupying minimum space arrangements/ equipment/plants for decentralized composting which may be aerobic/anaerobic / vermi. Mixing blades for composting Efficient mixing blades for small-scale / household composting material. Waste in public spaces Efficient, simple and economical methods of sweeping and sucking the littered waste in public places including narrow streets. Dissuading public littering Efficient, simple and economical methods of identifying persons littering, raising alarm so as to dissuade the public from littering. Cleaning of Sewers and Septic Tanks Smart and efficient cleaning techniques, with the objective of eliminating need for human entry. b) Help new deep-tech products find markets and early customers (commercialization). a) Potential for proposed product to meet existing Indian needs. b) Potential to deploy an existing technology or patent - to be specified in the application, without revealing the patent or IP. c) Ability to reach markets in the short- to- medium term. 1. Identification of market for product, and its estimated size. The applicant should have identified the first market (early adopter) they would be launching their product into. This choice of beachhead market, may evolve over the course of prototyping with detailed primary and secondary market research. 2. Clear articulation of a strong business model/outcomes and plan to deploy technologies. This is to measure the impact of the product (could be either financial or social, or both). The applicant should have a sound revenue model, social outcome/financial sustainability plan, and a plan to deploy product at scale. 3. Identification of appropriate market channels/partners. The innovator should have a broad level understanding of channels to launch/sell product and hence should have identified potential partners. We encourage applicants to do proper due diligence about feasibility of product launch through different market channels. 1. Proposed product, along with the patent number, or reference to the peer-reviewed paper. 3. Ability of product to address the market (product-market fit). 4. Proposed partnerships to design, test, pilot and deploy the product. The applications will be screened by a duly constituted committee of sectoral and financial experts for the purpose of screening and selection of applications for Atal New India Challenge. 1) What are the Atal New India Challenges? The Atal New India Challenges initiative by Atal Innovation Mission is aimed at supporting innovators creating products based on advanced technologies in areas of national importance and social relevance through a grant based mechanism, with access to handholding, mentoring and other technical support. 2) Why is Atal Innovation Mission launching Atal New India Challenge? India’s science and technology ecosystem is robust and effective. However, concern have been frequently raised about the ecosystem’s relatively lower ability to create products out of advanced research and deploy them in the Indian market. This program attempts to fill this gap in the ecosystem by providing grants oriented towards creating commercializable products from existing technologies, to fill needs across various economic and social sectors. 3) Who can apply for Atal New India Challenge? Government or private R&D organizations (other than a Railway R&D organization), academic institutions, academicians, or even individual innovators are encouraged to apply, provided they partner with entities with appropriate manufacturing capabilities. Any individuals looking to apply for their technologies/products in the identified 17 sectors should partner with entities able to manufacture, market and scale up their products, in keeping with the objective of the ANICs to rapidly deploy technologies across large markets. 4) How do I apply for Atal New India Challenge? All applications for Atal New India Challenge will be accepted online, and only through the dedicated form on AIM website. 5) When is the deadline for Application? The deadline for Application is 31ST JULY 2018. 6) What are the Eligibility criteria for Atal New India Challenge? a) Submit or provide a link to the research paper published in a reputed journal before the date of announcement of this scheme. b) Provide description, name and the registration number of the patent he holds. If the innovator/researcher is not the holder of the patent, the application should include information on the nature of the relationship with the patent holder, such as through licensing fee or profit/revenue share in the business plan, etc. c) A video describing and showing a prototype. The innovator who has identified or established partnership(s) with relevant partners for manufacturing, market deployment or early-stage pilots. As the focus of this challenge is to rapidly commercialize technologies/patents into products, it is important that innovator has either identified partners for manufacturing (which could be a MSME, or contract manufacturer, or laboratory) and early- stage pilots or established partnerships with these stakeholders. The applicant will have to provide the name and other details of the manufacturer and another potential. 7) What are the different Focus Areas for Atal New India Challenge? Atal New India Challenge has identified the following 24 as the focus areas. Fog vision system for road and rail: Increase deployment of technologies to reduce accidents in low visibility conditions - vehicle-attached, or improvements in street lighting infrastructure, or improved reflectors for higher pedestrian visibility, etc. Systems to predict identify and recognize rail failure using technologies: Advanced technology solutions to predict and prevent rail failures viz. automated track monitoring systems, rail track health, signaling and switching technologies etc. Predictive Maintenance of Rolling Stock: Solutions to monitor the health and safety of key components of the coaches, freight cars, locomotives which includes bearing and wheels to reduce catastrophic failures leading to improved safety and operating cost. Smart Mobility: Use of alternate transportation mechanisms for newly urbanizing regions / smart cities. Electric Mobility: technologies/innovations to increase the share of electric vehicles in all modes of transportation. Safe transport: technologies/innovations to reduce accidents and fatalities, with a special focus on two-wheelers / pedestrians. Instant Portable Water Quality Testing: Develop systems, products, technologies, or protocols to identify nature and/or concentration of biological/chemical contaminants in any given water sample. Sustaining drinking water sources – Ensuring drinking water sustainability is of paramount importance. Sustaining the sources depends the following major aspects: (i) source strengthening/sustainability (ii) regular operation and maintenance and (iii) replacing the aged infrastructure. Suggestions are invited to (i) Achieve source strengthening through innovative, measures and/or traditional water harvesting wisdom. (ii) Reduce the operation and maintenance cost of water supply schemes with special focus on decreasing power consumption (iii) Replace/repair the aging infrastructure through unique, cost effective, new/innovative technologies/methods. Digital Water Management – IT and Mobile phones have enabled easier access to various services. How to use these technologies to solve day-to-day managerial issues to (i) assist to make district water budgets and District/Block level water managers to know on day-to-day basis, the habitation-wise quantity and quality water supplied and (ii) make every household a water smart household by informing them about the quantity and quality of water available from their nearest source to plan their daily family water budget. Ideas can be mix of technologies, management solutions, awareness games etc. Data analytics for water governance: Various Stake-holder Ministries of Government of India have huge individual data bases on water supply; water availability; groundwater; measures taken up for recharge; rain water harvesting; household-wise drinking water source access data; enrollment in schools etc. However, they are in individual silos. At district level, these data can be aggregated and analyzed to understand how each one of them affect/interact with one-another. The question is Using big data analytics techniques, how to generate quality information at District/State levels, using above databases, that would aid in policy formulation for effective water education & governance and management? Mini Desalination plants in coastal areas: Low cost, environmental friendly, low power technologies available for setting up and operating mini desalination plants for coastal habitations. Grey water management: Many States are providing higher per-capita water supply service levels in rural areas. This is leading to generation of significant grey water in rural areas and needs to be managed usefully. Suggestions are invited for innovative, low cost and simple technologies to manage the grey water in rural areas. Affordable Desalination/Recycling Technology: Deploy technologies or products to recycle water at household- and community-levels, Create products/processes/technologies for low-energy consumption desalination. Waste management recycling and reuse: Deployment of technologies for waste management, e.g. solid, e-waste etc. Garbage composition devices: Portable/handheld scanner/device that can distinguish the composition of garbage collected from households as wet or dry. Quality of compost: Portable/handheld device that can quickly determine the quality of compost (also whether the compost heap meets FCO standards). Decentralized composting: Economical, efficient, modular, aesthetic, environment-friendly and occupying minimum space arrangements/ equipment/plants for decentralized composting which may be aerobic/anaerobic / vermi. Mixing blades for composting: efficient mixing blades for small-scale / household composting material. Waste in public spaces: Efficient, simple and economical methods of sweeping and sucking the littered waste in public places including narrow streets. Cleaning of Sewers and Septic Tanks: Smart and efficient cleaning techniques, with the objective of eliminating need for human entry. 8) What are the key parameters in the selection of an application for Atal New India Challenge? Help create products from existing technologies relevant for national and social causes (productization). Help new deep-tech products find markets and early customers (commercialization). Potential for proposed product to meet existing Indian needs in the identified sectors. Potential to deploy an existing technology, prototype or patent - to be specified in the application, without revealing the details that have not been published or are not in public domain. Ability to reach markets in the short- to- medium term. Ability to establish and run a sustainable enterprise that can scale up and deploy the solution far and wide. 9) What are the Evaluation criteria for applications for Atal New India Challenge? Identification of market for the product, and its estimated size. The applicant should have identified the first market (early adopter) they would be launching their product into. This choice of beachhead market may evolve over the course of prototyping with detailed primary and secondary market research. Clear articulation of strong business model/outcomes and plan to deploy technologies. This is to measure the impact of the product (could be either financial or social or both). The applicant should have a sound revenue model, social outcome/financial sustainability plan, and a plan to deploy product at scale. Identification of appropriate market channels/partners. The innovator should have a broad level understanding of channels to launch/sell product and hence should have identified potential partners. We encourage applicants to do proper due diligence about the feasibility of product launch through different market channels. 10) What is the selection process for Atal New India Challenges? All the shortlisted candidates will present their technologies and business plans to a committee of sectoral and financial experts. Applicants or applicant teams will be selected by the committee on their ability to develop potential technologies, create products, and take them to market. 11) What are the milestones? Milestones are the parameters to evaluate the progress of the selected applicants through the stages from prototype to commercialization. The committee will provide every applicant with milestones depending on the sector and nature of proposal. Applicants can also suggest milestones for their respective proposals while filling the application form, but those will not be binding on the committee. 12) How can ANIC help me to make my product successful? Applicants showing capability, intent, and promise to be able to productize technologies will be awarded grants upto ₹1 crore. This grant support will be supplemented by mentoring, handholding incubation and other support as needed, at various stages of progress, to bring products to market and wider deployment. 13) How will the grant be awarded? First tranche: Upto 30% of the amount recommended by committee. Second tranche: Upto 50% of the amount, contingent on achieving milestones as recommended by committee. 14) What are the eligible expenditures for grant money under Atal New India Challenge? 15) Can I apply, if I have received other government grants? No, as a criterion for application a Self-certification is required stating that the applicant has not received any grant, past or ongoing, from any ministry or department of the Government of India or any state government, for the same or a similar purpose. (b)	help new deep-tech products find markets and early customers (commercialization) in the context of India. One of Atal Innovation Mission’s primary goals is to incentivize innovation in areas critical to India’s growth, such as health, housing, hygiene, energy and water. Researchers have long talked of the ‘Valleys of Death’ at the early stage and commercialization stage in taking innovations to market. The Atal New India Challenge aims to address the second Commercialization Valley of Death, in which innovators are unable to access resources for piloting, testing, and market creation. The Atal New India Challenge is an open call to design and demonstrate market-ready products based on cutting edge technologies in identified focus areas. Applicants showing capability, intent, and promise to be able to productize technologies will be awarded grants of upto 1 crore, strictly on a milestone basis. Increase deployment of technologies to reduce accidents in low visibility conditions - vehicle-attached, or improvements in street lighting infrastructure, or improved reflectors for higher pedestrian visibility, etc. Advanced technology solutions to predict and prevent rail failures viz. automated track monitoring systems, rail track health, signalling and switching technologies etc. Affordable Recycling technology - Deploy technologies or products to recycle water at household and community levels. Deployment of technologies for waste management, e.g. solid, e-waste etc. Solutions to monitor the health and safety of key components of the coaches, freight cars, locomotives which includes bearing and wheels to reduce catastrophic failures leading to improved safety and operating cost. Ensuring drinking water sustainability is of paramount importance. Sustaining the sources depends the following major aspects: (i) Source strengthening/sustainability (ii) Regular operation and maintenance and (iii) Replacing the aged infrastructure. Achieve source strengthening through innovative, measures and/or traditional water harvesting wisdom. Replace/repair the aging infrastructure through unique, cost effective, new/innovative technologies/methods. IT and Mobile phones have enabled easier access to various services. How to use these technologies to solve day-to-day managerial issues to (i) assist to make district water budgets and District/Block level water managers to know on day-to-day basis, the habitation-wise quantity and quality water supplied and (ii) make every household a water smart household by informing them about the quantity and quality of water available from their nearest source to plan their daily family water budget. Ideas can be mix of technologies, management solutions, awareness games etc. Using big data analytics techniques, how to generate quality information at District/State levels, using above databases, that would aid in policy formulation for effective water education & governance and management? Low cost, environmental friendly, low power technologies available for setting up and operating mini desalination plants for coastal habitations. Many States are providing higher per-capita water supply service levels in rural areas. This is leading to generation of significant grey water in rural areas and needs to be managed usefully. Suggestions are invited for innovative, low cost and simple technologies to manage the grey water in rural areas. Smart and efficient cleaning techniques, with the objective of eliminating need for human entry. Do you plan to manufacture this product within the applicant entity, or in partnership with other entities? What will be the time commitment of the key members of the applicant team on the proposed project? Invalid File Format! File Format Must be PDF. Maximum File Size Limit is 1MB.